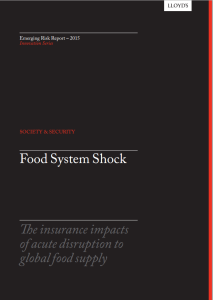 The insurance group Lloyd’s recently commissioned the study “Food System Shock: The Insurance Impacts of Acute Disruption to Global Food Supply” to explore some of the potential risks of a series of extreme events on the global food system and the implications this might have on food security and the insurance industry. IFPRI’s IMPACT (International Model for Policy Analysis of Agricultural Commodities and Trade) team was invited to participate in a workshop hosted by Lloyd’s in February and to provide quantitative foresight analysis of potential consequences of extreme crop productivity shock events. 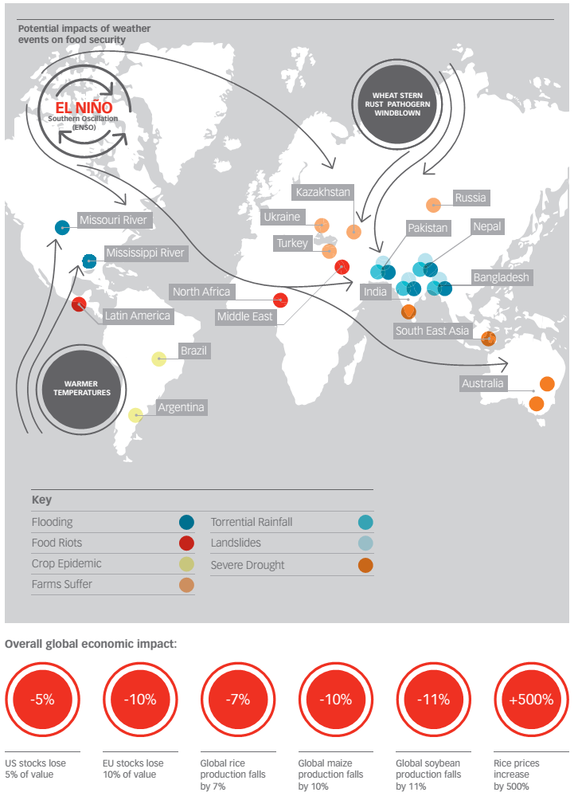 These scenarios were designed to explore systematic weaknesses in the global food system and raise questions of what could happen if major breakdowns in the system were to occur due to extreme climatic events. For example, one of the scenarios explored the consequences of negative shocks on agriculture caused by a strong warm phase of the El Niño Southern Oscillation, as shown in the following figure. These scenarios had rich narratives describing not only the direct impacts on agriculture, but also potential shocks to global infrastructure (ports, roads, rail, etc.) that could further stress the global food system. Based on these narratives, a series of multi-crop and multi-region production shock scenarios were quantified and analyzed using IMPACT, and served as inputs into Lloyd’s overall analysis. Lloyd’s also went a step further and considered a series of responses that could occur with potentially significant consequences on political stability, highlighting the interconnectedness of the agriculture sector with the global political economy. The full Lloyd’s report is available online here.